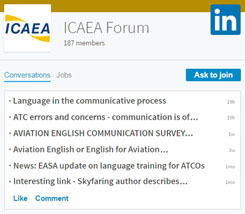 The 2012 ICAO Rated Speech Sample Training Aid (RSSTA) was developed under the auspices of ICAEA by a panel of international academic, linguistic, testing and operational experts. support ICAO’s efforts to enhance language proficiency test standards. 52 graded audio samples that demonstrate overall performance at ICAO Levels 1 to 6. Each sample is graded against ICAO LPR Rating Scales for Pronunciation, Structure, Vocabulary, Fluency, Comprehension and Interaction. Audio samples are of pilots and air traffic controllers completing a variety of ELP test tasks. Speakers have a variety of first languages including Arabic, Chinese, Hungarian, Polish and Russian. ICAO issued the first RSSTA in CD-ROM format in 2006. As part of its ongoing commitment to improve standards in aviation English, ICAO commissioned ICAEA to produce a second RSSTA in 2010. Its purpose is to help aviation language test service providers, examiners, teachers and also training, human resources and operational management to understand what constitutes an acceptable level of English for pilots and air traffic control officers. Unlike the original training aid which was distributed on CD-ROM, the second set of samples is available online, free of charge, through the ICAO website. 75 raters from 23 countries engaged in the rating exercises. The raters, from both operational and language backgrounds, assessed over 210 samples of language from a range of tasks representative of the materials that are currently available in the testing of aviation English. The data from the rating exercises was subjected to a many-facet Rasch analysis (FACETS, Linacre 2002) to identify samples which provide internationally agreed, reliable indications of each candidate’s performance in the six criteria of the ICAO rating scale.